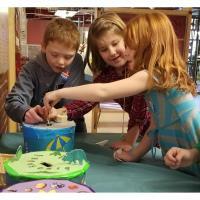 DOVER – As we enter the new year, the fun and discovery happening at the Children’s Museum of New Hampshire isn’t slowing down thanks to local investment efforts. The museum has received $100,000 in business tax credits from the New Hampshire Community Development Finance Authority (CDFA) and because of that support is busy planning an expansion project and exhibit updates. With the help of donors such as Northway Bank and Newburyport Savings Bank, the museum is excited to start adding a new Play Patio adjacent to the museum’s entrance and to enhance an existing classroom with interactive technology to transform it into additional exhibit space with the flip of a switch. “We’re excited for these projects because it will help us better serve our more than 101,000 annual visitors,” shared CMNH president Jane Bard. The Play Patio will be a three-season outdoor space for water experiments and messy play, nature exploration and picnics. The interactive classroom will incorporate new technology with a giant LED lighting wall, projected floor games, and light and shadow play. To learn more about how to invest in local community development projects through the purchase of tax credits, please contact Paula Rais, CMNH’s Vice President of Development and Community Engagement at 603-742-2002. To learn more about the Children’s Museum of New Hampshire visit www.childrens-museum.org. The weekend after Christmas is the perfect chance to come enjoy that new gift membership! Please note: The museum is CLOSED Monday, December 24 and Tuesday, December 25. You voted on which theme-day you wanted for the day after Christmas, and we listened! Will it be Dinosaur Day, Tropical Beach Day, or Art Day!? Join us today and find out which theme won! No registration necessary and all activities are free with museum admission. Visit www.childrens-museum.org for more info. Meet and interact with the museum’s friendly family of various robots, see a 3D printer demo, make robot crafts, hear robot stories and more on this day all about…robots! No registration necessary and all activities are free with museum admission. Visit ww.childrens-museum.org for more info. Each day this weekend we’ll be exploring activities, challenges, games, stories and a scavenger hunt all about engineering! No registration necessary and all activities are free with museum admission. Visit www.childrens-museum.org for more info. Gallery 6 features art by nine regional artists who use texture, pattern, scale, and line found in natural elements to reframe our surroundings in exciting ways. Imaginative vantage points turn crowds into colorful dots, and stone surfaces into topographical maps. Harmony is found between the channels in wood bored by beetles, and the arrangement of trees in a landscape seen from above. Participating artists include Matthew Boehm (Hopkinton, NH), Kyle Browne (Boston, MA), Jackie Brown (Brunswick, ME), Kayla Goulden (Portland, ME), Kate Higley (Eliot, ME), Sarah Hulsey (Somerville, MA), Nathalie Miebach (Boston, MA), Suzanne Pretty (Farmington, NH), and Miranda Updike (Ipswich, MA). The Gallery is open anytime the Children’s Museum of New Hampshire is open and is sponsored by the NH State Council on the Arts, the Fuller Foundation, and Georgia-Pacific. To learn more visit www.childrens-museum.org. Families with children on the autism spectrum are invited to the museum for a free visit. Exploring Our Way provides opportunities to enjoy family time at the museum in a safe, understanding environment, allows parents to network with one another, and helps families discover new resources. Exploring Our Way guests are welcome to stay and play when the museum opens to the public at noon. Children must be accompanied by an adult and siblings are welcome. Exploring Our Way is generously supported by H.O.P.E. Behavioral Consulting, Kennebunk Savings Bank and Eversource and the Finlay Foundation. This program is free. Visit www.childrens-museum.org for more information. Do you have a little one that can’t sit still? This active storytime on Tuesday afternoons will explore books that encourage participants to get up and MOVE! We will also have songs, rhymes, interactive flannel board stories, and more. There will be a new theme every week so check the website or the museum’s Facebook page for details. This program is drop-in and free with museum admission, and FREE for museum members. Visit www.childrens-museum.org to learn more. Wee Ones Wednesdays is an interactive weekly drop-in program for children ages 2-4 and has been designed as PRE pre-school. Children and a parent or caregiver enjoy art, music, movement and conceptual learning with a new theme each week. Sessions are offered from 9:45-10:30am and 10:45-11:30am. The cost per adult/child pair is $7 for Museum members and $10 for Non-members. Additional children in a family are $5 each for Members and $8 each for Non-members. We also offer a punch card option for Members who attend regularly: a 5-class punch card is $30 or 2 cards for $55. Visit www.childrens-museum.org for more information. The First Friends Playgroup for children ages 6 months to two years is a drop-in opportunity for parents and babies/toddlers to play together in the Early Learning Landscape area. Join Early Childhood and Literacy Coordinator Meredith Brustlin, MLIS, for Playgroup and Baby "Lap Sit" Storytime at 9:45am. Learn important early literacy skills to practice with little ones and enjoy some rhymes, puppets, songs and stories. This program is free for museum members and regular admission applies for non-members: $10 for adults and children, $9 for seniors and no charge for babies under 12 months old. Visit www.childrens-museum.org for more information. Children ages 2-5 and their caregivers come together for a variety of activities for this drop-in program offered every Thursday. There will be new themes and activities every week so check the museum’s website or Facebook page for details. This program is free with museum admission and free for members. Participants must check in at the front desk. We can accommodate up to 12 children for this program. Visit www.childrens-museum.org to learn more. Visit anytime after 3pm until 7pm on the first Friday of each month during the school year and enjoy the museum for only $3 per person. First Friday corresponds to the monthly Dover Art Walk taking place at various galleries throughout downtown Dover. The museum’s Gallery 6 current art exhibition “Organic Cartography” will be open and is part of the Art Walk, is free to view anytime the museum is open and is sponsored by the NH State Council on the Arts, Georgia-Pacific and the Fuller Foundation. Visit www.childrens-museum.org for more info. Join us for a magical wintry journey to the Cochecho Country Club in the C&J double-decker bus to hear a reading of the classic children’s holiday story, The Polar Express by Chris Van Allsburg © 1985. Enjoy refreshments, receive a keepsake gift and a visit from a very special guest. Pajamas are welcome! Ticket price includes a keepsake family photo, time to explore the Children’s Museum and a make-and-take holiday craft. Reserve your seat early. Space is limited! Cost is $25 per person and children ages two and under are free (must sit on parents’ lap during the journey.) This program is made possible through a partnership with the Cochecho Country Club, C&J Bus Lines and our premier sponsor Federal Savings Bank. To learn more or to register, visit www.childrens-museum.org.